Hiyorimi Yakushido Temple (日向見薬師堂) is one of the historical sites of Shima Onsen. It is designated as the national historical asset. This temple was built in 1598 by Fujiwara Iesada for praying Sanada Yukimura. The inside of the temple was built in 1537. Free foot Onsen and public Onsen is located right in front of this temple. 1. use local bust to Shima Onsen. This temple is the only national historic asset in Gunma Prefecture, and also the oldest temple in Gunma. 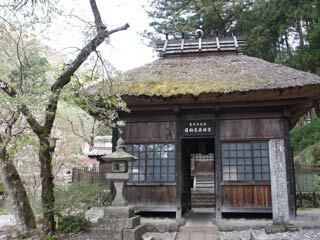 ... is the small buildings located in front of Yakushido Temple. It was built in 1614, and used for Buddhist practice for travelers who visit this Onsen.